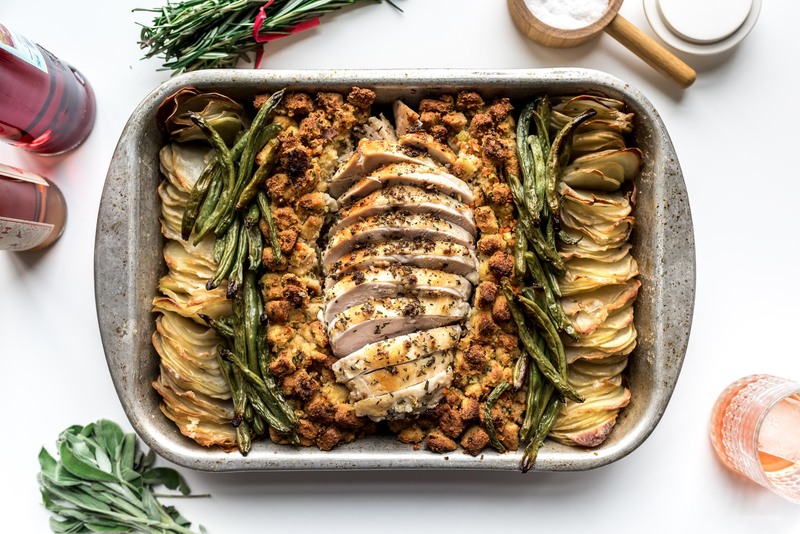 Thanksgiving just got a little easier with this sheet pan turkey dinner featuring juicy turkey breast, classic stuffing, crispy-creamy potatoes, and blistered beans. So nice you'll want it twice! 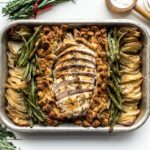 If you’re looking for an easy Thanksgiving meal for two (or four), I’ve got you covered with this easy sheet pan turkey dinner. It has everything you could want or need: turkey, stuffing, potatoes, and beans. Best of all, it’s hot and fresh out of the oven in an hour and twenty minutes. Are you guys ready for Thanksgiving? What’s your favorite part? For me, it’s the food, always. Specifically mashed potatoes and stuffing. I feel like I could have meals of mash and stuffing and be happy forever. Other people (I’m giving Mike the side eye here) need things like turkey so of course we’ll make that too. Just kidding, I love turkey! For some reason, probably because we hardly ever make it during any other time of the year, turkey feels festive. Sometimes (okay, all the time), I want to feel festive without making a giant turkey. 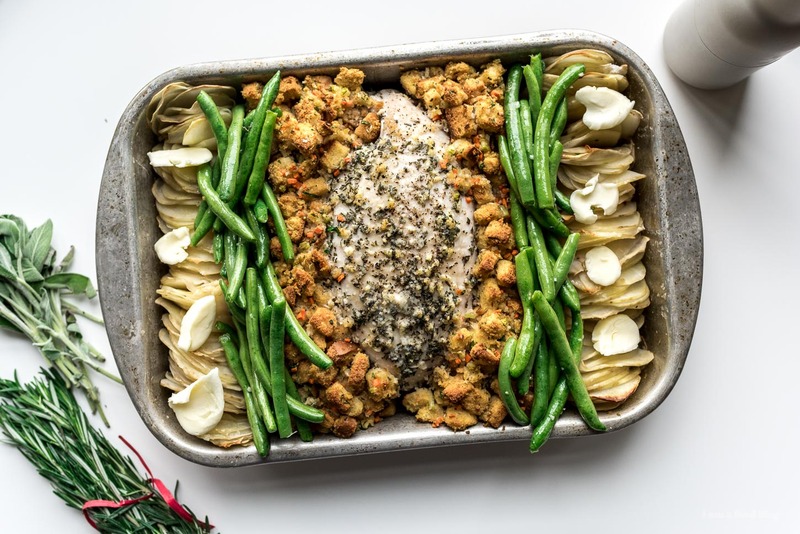 Enter: the sheet pan turkey dinner. It’s quick, it’s easy, and best of all, it’s a whole heck of a lot faster than making a whole turkey. 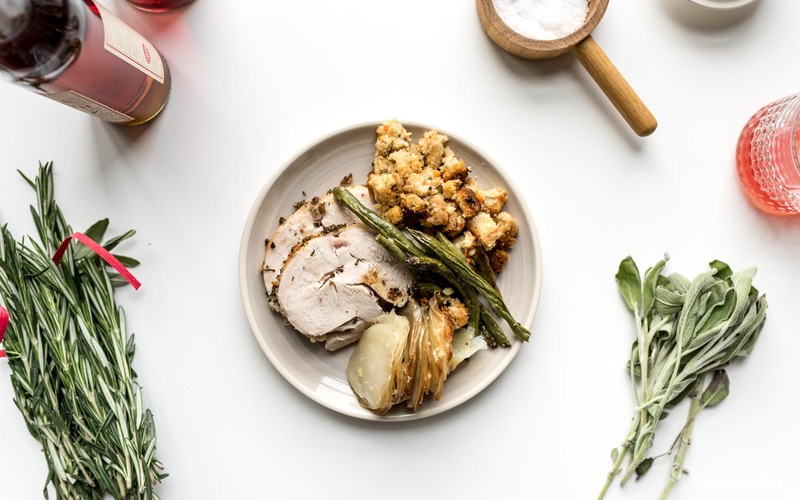 Turkey breast cooks in the oven in just an hour (sometimes a bit more if you have a big guy) so by the time your turkey craving hits, all you need to do is wait an hour and you can stuff your face. 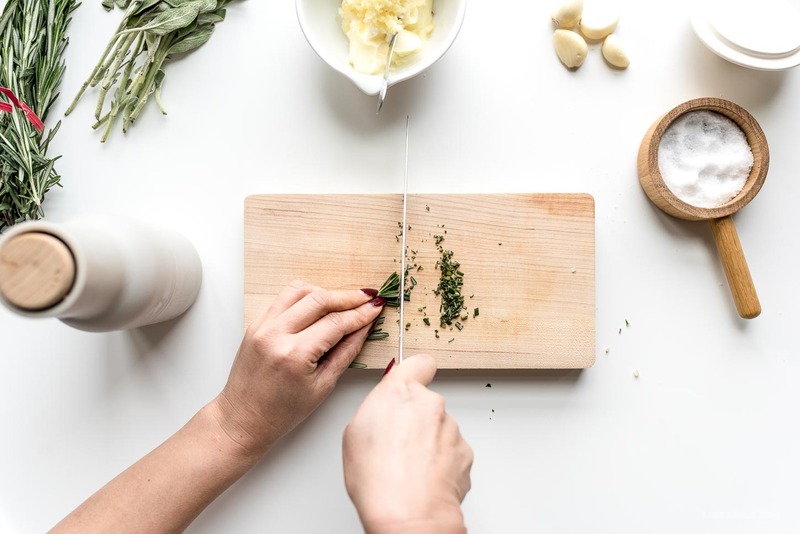 Of course, you need to do a little prep before that too, but really, it’s not too much work to dice some aromatics and vegetables, throw everything onto a sheet pan and chill out while the turkey’s in the oven. Here I went with a butter herb turkey breast, classic stuffing/dressing (I always call it stuffing even if it’s not stuffed in a turkey), blistered green beans, and thinly sliced potatoes that kind of mimic a scalloped/domino potato. The potatoes were dreamy: creamy on the bottoms and crispy-crunchy on top. The stuffing was excellent too. On another note, how many people do you think this feeds? It’s a 2 pound turkey breast, four large potatoes and a heck of a lot of stuffing and green beans. Mike absolutely insisted that it was a sheet pan meal for two but I thought it could definitely feed four. We made this right before we headed out for dinner with my family (my parent’s 42 wedding anniversary!) so we didn’t eat as much as we normally would so we had a lot of leftovers, which reinforced my idea that it could feed four. But then, we we got home from dinner, Mike had three more slices of turkey and the next day we polished off the leftovers for lunch. So, in the end I kind of sort of agree with Mike, just because I love leftovers. This will serve two, generously with leftovers and will serve 4 people who have average to small appetites. But, if you’re scared that you won’t have enough food for people (like I often am), you’ll probably want to make two sheet pan dinners? Or maybe even a whole turkey? We’re going to be making one this weekend, so if you’re looking for a whole turkey recipe, I got your back! 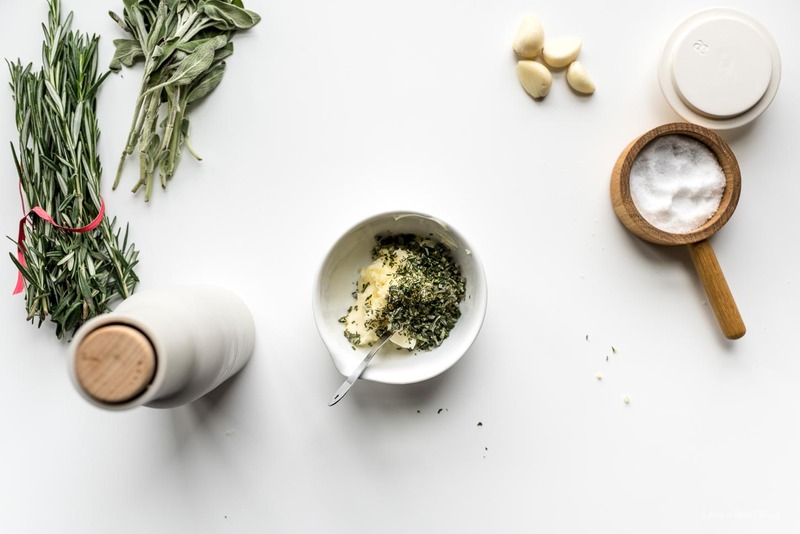 Whisk together the butter, herbs, garlic, salt and pepper. 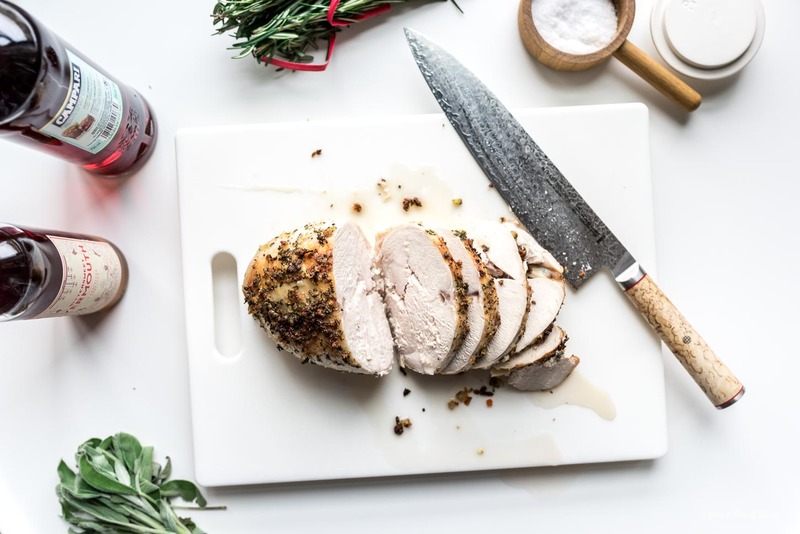 Place the turkey in the middle of a foil lined baking sheet and brush generously with the herb garlic butter. 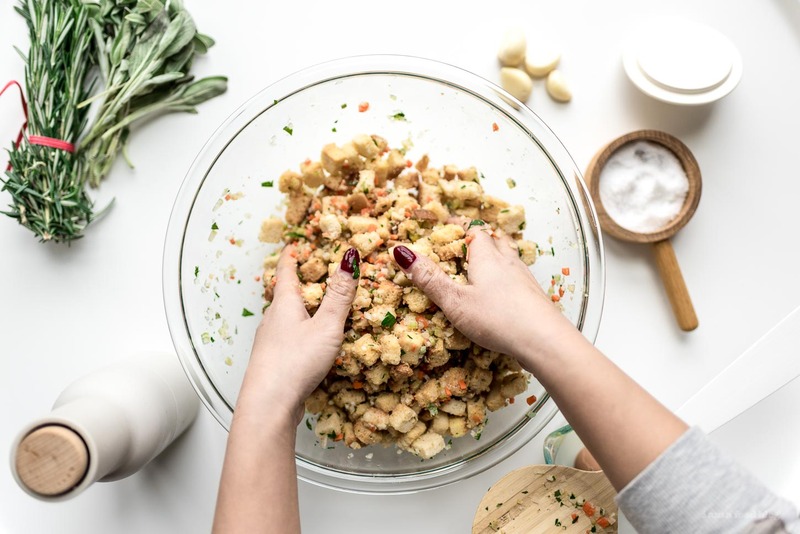 In a large bowl, toss together the stuffing ingredients then place around the turkey breast. 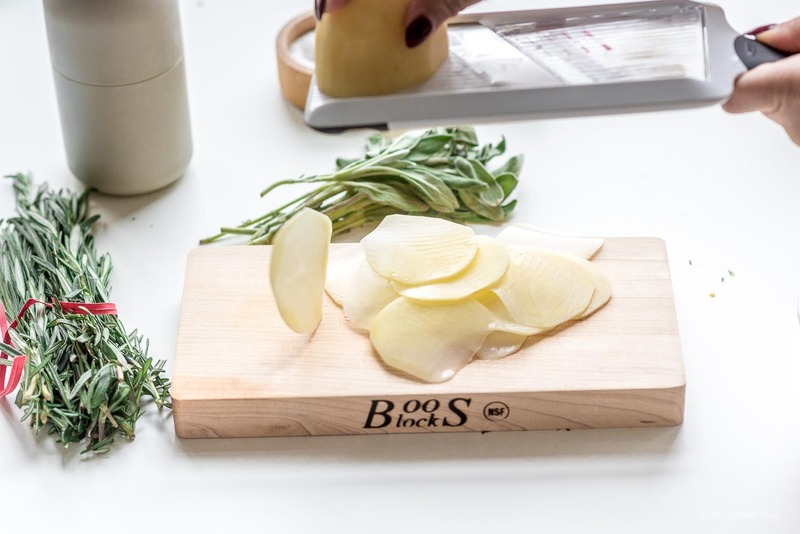 Peel the potatoes and thinly slice (or use a mandoline). Loosely arrange in the pan, dot with butter and season with salt. Bake for 30 minutes. Meanwhile, toss the beans with the butter, garlic, and salt and pepper. Add the beans to the pan and bake for another 30 minutes. Check the internal temperature of the turkey with a thermometer (it should reach 155°F, resting it outside of the oven will bring it up to 165°F.) Remove from the oven, rest and tent for 15 minutes. Slice the turkey breast and enjoy! 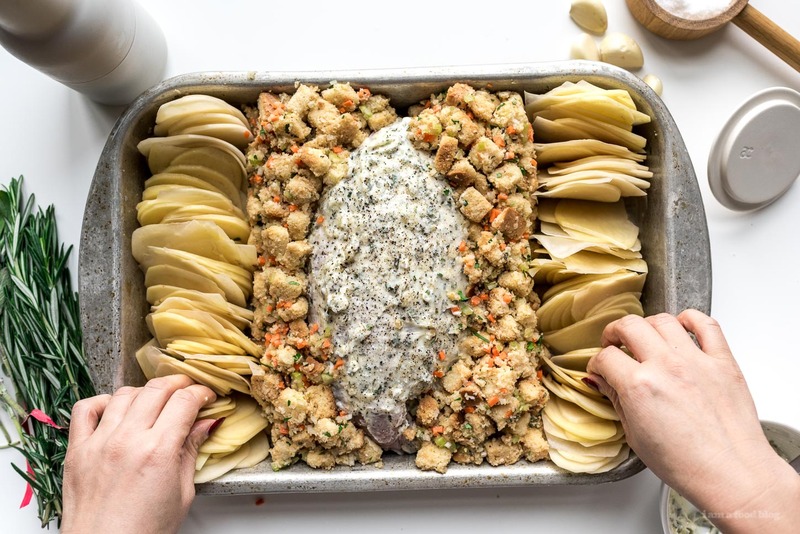 Can you please recommend which sheet pan I should buy to make this? I don’t own any currently and am not sure what specs to look for when I buy one. i used a regular sized (9×13) cake pan because the sides are a bit higher but you could also use a quarter sheet pan as well, but it won’t be as deep. in general, i think quarter sheet pans (9×13) are a very good size to have around the kitchen. What type of sheet pan do you use? I have just a regular one but the sides seem a lot taller on yours! i used a regular sized (9×13) cake pan so the sides are a bit higher – it’s the same size as a quarter sheet pan. hope that helps! Thank you! I have a couple of those too – I tend to be a bit messy, so the higher sides may be the way to go for me! Making this for Thanksgiving for 2, love it! This is brilliant! I’ll be trying this recipe this year, thanks for sharing! I am looking forward to making this today! I don’t see it in the instructions but I think the herbs and seasonings listed with the turkey go on with the butter? This was tasty! Thank you! It totally hit the Thanksgiving spot for me (I have a toddler and am not sure I’m going to have much of a chance to enjoy dinner at my in-laws because he’s going to be terrorizing their house!) I did sweet potatoes instead of regular and brushed them with the same herb butter as the Turkey. I made mashed potatoes (because those say Thanksgiving to me!) and wish I had it together to make some gravy. I made this for Thanksgiving and it was great! Seriously, I could not believe what a time saver it was!! Start to finish this took about an hour and 40 minutes. 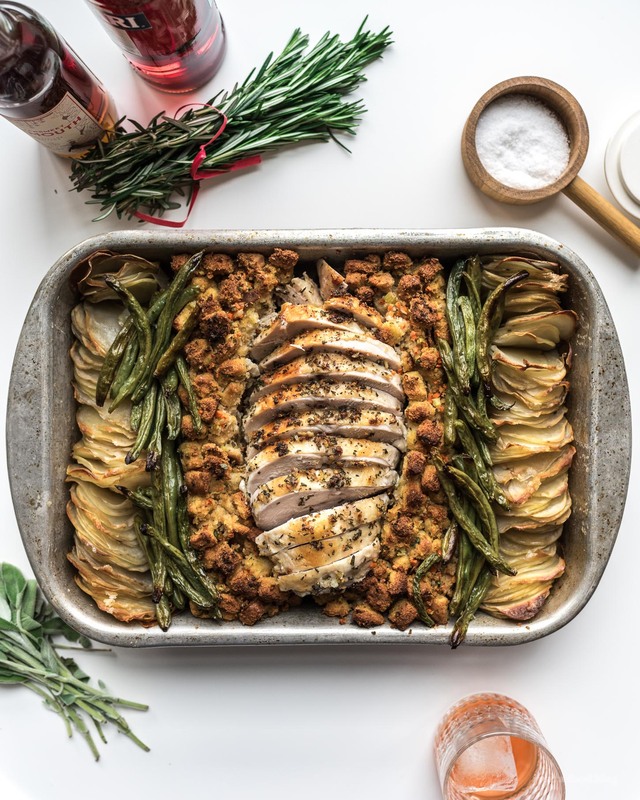 I would definitely make this again next Thanksgiving (or really any time) with a few modifications: 1) I would use a 1/2 sheet pan, just to give everything some room to ensure everything cooks evenly. 2) I would use 1 pound of potatoes. I originally used 1-1/2 pounds potatoes and that was a bit much. 3) I would season the potatoes with some salt pepper and garlic before putting them in the pan. THANK YOU for such an awesome recipe! This was the first year I did not spend all day in the kitchen!! I look forward to making this again! SO excited to see this recipe. Always tricky finding different items to make each year, this is a one and done! Do I have the butcher de-bone a regular turkey breast? Thank you! We made this for Christmas dinner and it was fantastic!! My husband and I both agreed that we will make turkey this way from now on. The turkey was juicy and the potatoes and stuffing were brown and crispy and the green beans caramelized. We put a couple slices of lemon under the turkey breast which gave a little zing to everything. So excited to have found this recipe – it’s a keeper! I’m a dark meat “thigh” person, any recommendation for that? I’m single but have dinner with my kids and grandkids but like making my own after Thanksgiving dinner using the thighs to have my own leftovers. i think this would work with thighs! it’ll be best if you let the thighs come up to room temperature before cooking – this’ll help the thighs cook faster. increase the temp to 400° and start off by cooking the thigh skin side down. at the 30 minute mark, flip it right side up. add the beans later so they don’t get as blistered. if the stuffing or potatoes start to brown too quickly, cover them with foil while the turkey’s roasting. hope that helps!